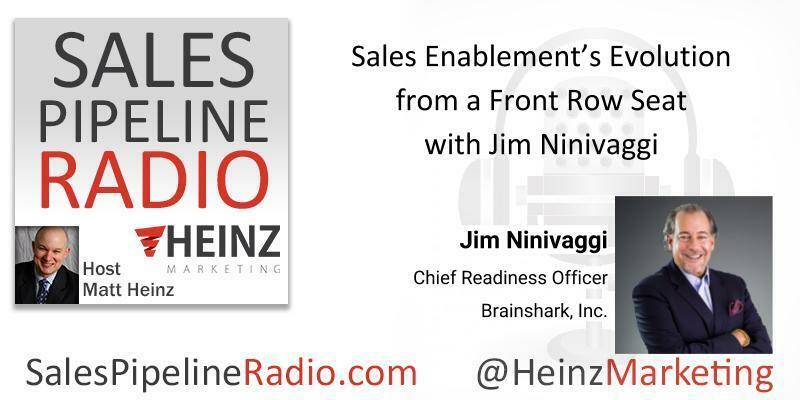 Join us for this episode which is a five minute definition of Sales Enablement from Jim Ninivaggi, Chief Readiness Officer at Brainshark, Inc. In this extract from the original program, Sales Enablement’s Evolution from a Front Row Seat with Jim Ninivaggi Jim defines sales enablement in simple direct terms that can be applied at every B2B company. Brainshark is one of the preeminent companies in the field of sales enablement. Jim is an established thought leader and business analyst from his former role as the head of SiriusDecisions' sales enablement practice. He has researched and presented to business leaders around the world on advanced concepts in optimizing sales talent, maximizing rep productivity, world-class sales leadership and sales enablement technology. Jim has published more than 200 research briefs and engaged audiences at hundreds of conferences, forums and executive presentations.